Aung San Suu Kyi Gives Long-Overdue Nobel Speech Burmese opposition leader Aung San Suu Kyi says the Nobel Peace Prize she won while under house arrest 21 years ago helped to shatter her sense of isolation and ensured that the world would demand democracy in her military-controlled homeland. 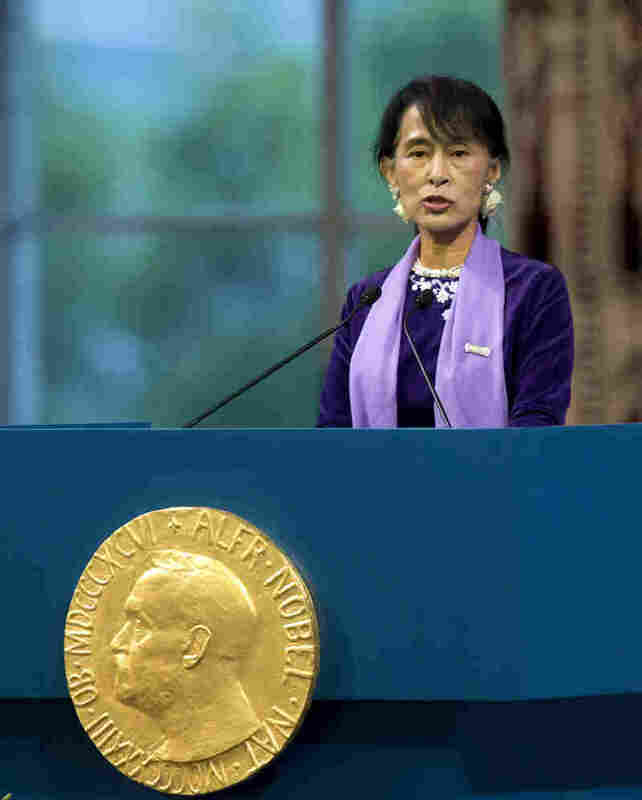 Nobel Peace Prize laureate Aung San Suu Kyi gives her acceptance speech in Oslo, Norway, on Saturday. The Burmese opposition leader was awarded the prize two decades ago. Nobel Laureate Aung San Suu Kyi, the opposition leader of Myanmar, also known as Burma, spoke in Norway Saturday, formally accepting the peace prize she was awarded in 1991 while under house arrest. Her supporters portrayed the moment as a belated victory for democracy and human rights. Introducing Suu Kyi, Norwegian Nobel Committee Chairman Thorbjorn Jagland hailed her as a champion of mankind, whose words give hope to the world. He added that his committee was right to award her the prize, and that thanks to people like her, democratic states will always prevail over autocratic ones. "The democracies of the world should not despair today when they see authoritarian regimes outpacing their economic growth," Jagland said. "This is temporary [and] the regimes will be broken apart by inner contradictions if they do not reform themselves." When Suu Kyi was awarded the prize in 1991, she was still under house arrest. So her husband Michael Aris and two sons, Kim and Alexander, accepted the prize for her. In explaining the prize's meaning to her, Suu Kyi said that it had helped to pull her out of reality-distorting isolation, and focused attention to her people's struggle against dictatorship. She appealed for help in freeing the remaining Burmese political prisoners who were not included in several recent amnesties granted by the government. "I am standing here because I was once a prisoner of conscience," Suu Kyi said. "As you look at me and listen to me, please remember the often repeated truth that one prisoner of conscience is one too many. "Those who have not yet been given access to the benefits of justice in my country number much more than one. Please remember them and do whatever is possible to affect their earliest, unconditional release," she said. Suu Kyi recalled how her ordeal prompted her to examine notions of suffering within her Buddhist faith, and the plight of the world's refugees, migrants and victims of human trafficking. "I thought of that great mass of the uprooted of the earth who have been torn away from their homes, parted from families and friends [and] forced to live out their lives among strangers who are not always welcoming," she said. Those words could well describe Burma's Muslim Rohingya minority. Their recent clashes with Buddhists in western Rakhine State have left at least 50 dead and thousands displaced. Myanmar's government refuses to recognize Rohingyas as citizens and Suu Kyi has not taken a clear stand on the issue. Suu Kyi's European victory lap will take her on to Ireland, the United Kingdom and France. The international support she garners there will be important, but the real test of her political skills comes when she returns home at the end of the month and begins her new job as a member of Parliament.